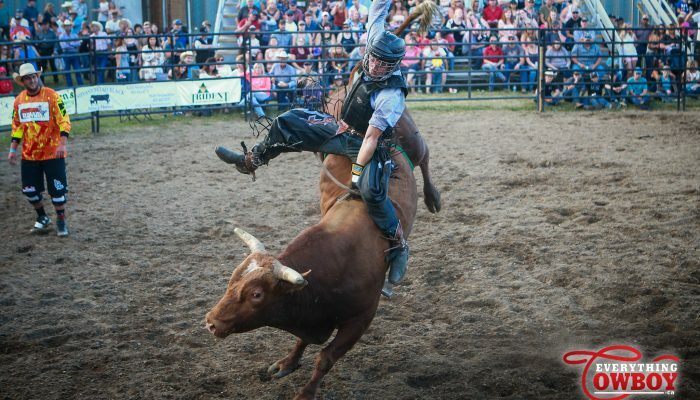 This year it features $15,000 in prize money, a $5,000 bonus to the event winner and another incentive series consisting of $7,500 in prize money which will be awarded to the top 2 riders earning the most points between Czar, Coronation and Stavely. First will pay $5,000 and second is worth $2,500. A rider must compete at all three to qualify. The arena is set up already and looking impressive with a few new sets of bleachers. Gates for the beer gardens open at 3:00pm and wild pony races start at 6:30. PBR action begins at 7:00. Tickets are $20 with 12 and under free. Tickets for the dance after the show are another $10, camping night of the event is free on park and subject to availability. Wacey Anderson made his picks ahead of the event. The No. 4 man in the PBR Canada National Standings is riding as consistent as he ever has throughout this July run of events. Cody has placed at his last three PBR events and will be looking to continue the trend in Czar. He is matched up against Funky Cold Medina from the Flyin’ High string, and to be honest I don’t know anything about this bull but if he is from the High String I’m sure he will be great. Look for big things from these two! Juan Carlos is a guy who rides really good when he is on top of his game, he has spent a considerable amount of time on the 25th PBR: Unleash The Beast as well. He is matched up with a bull from my buddy James Foley called Savage Sensation. I have yet to see this little bull live yet but from the video’s I have seen of him he looks like an electric little dude! This could end up being a great matchup! Ol’ Lon Dart could not have plucked himself a better one out of the draw here in Czar, I watched these two match up for about 85 points last fall at the CPRA Grassroots Finals. Lonnie is also hot off a win in Kinsella so he is in the right frame of mind heading into this event. On top of all that Lonnie will be looking to solidify himself in the Top 35 in the PBR World Standings heading into the second half of the 25th PBR: Unleash The Beast. Don’t be surprised if Lon finds his way back to the winner’s circle on Friday! Brick is the number one gun in the PBR Canada Standings and the No. 29 man in the PBR World Standings, for good reason as well! Brock has been having an outstanding season and seems to be staying on everything they run under him. In Czar he is matched up against Homeboy from the Skori family which is a bull I really like. He can be a little squirley in the box but once a guy gets out on him he looks like he could be fun! This is my pick to win the round! !